You might have already joined Google Plus, if not you can get one invitation from us. Google Plus is up with great features which makes the users to use it frequently. As we know Google already announced that we can Sign in to Google accounts with multiple emails. 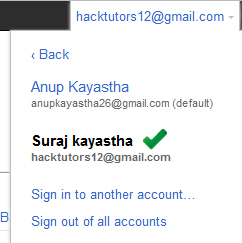 So, we can also use multiple emails to sign in to Google Plus. Lets see how we can do it. 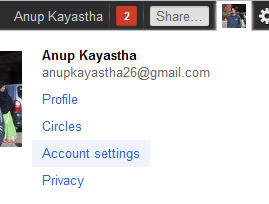 Log in to Google Plus and click your name containing at the top right side of the page. Click Account settings option. In the Security, you'll see Multiple sign-in. Click 'Edit' link just next to it. In the next screen choose 'On' option and check all the required that will make you sure how to use multiple sign in feature (see below). No finally you can enter you username and password of your existing Gmail email. After all, you can switch to multiple accounts. See below. Finally you are done and enjoy using Google Plus. If you know more tricks about Google plus then kindly share it via comment below.